25 October 2016 – Seven years ago this month, 11 Saudi citizens established the Saudi Association for Civil and Political Rights (ACPRA) to address the deteriorating human rights situation in the country and to advocate for constitutional reforms. One of ACPRA’s co-founders, Abdullah Al-Hamid, has been championing its values of accountable governance and human rights for decades and continues to do so despite his imprisonment. In 1993 al-Hamid co-founded the one of the first opposition organizations in the country, the Committee for Defense of Legitimate Rights (CDLR). The CDLR openly challenged the monarchy, accusing the government of not doing enough to protect the legitimate rights of its people. Though Saudi officials quickly banned the organization and imprisoned al-Hamid for his work with the group, he resumed his activism, advocating that governance can be compatible with the rule of law, equality for all citizens, and human rights while still maintaining its Islamic integrity. In the early 2000s Al Hamid, along with Saudi reformists Matruk al-Faleh and Ali al-Dumayni, pushed the idea of a constitutional monarchy in Saudi Arabia. Together, they helped draft various petitions calling for the gradual transition of the Saudi monarchy towards a constitutional monarchy. In his defense of a constitutional monarchy, al-Hamid argues that the role of the government is to administer the people’s will rather than subdue it. 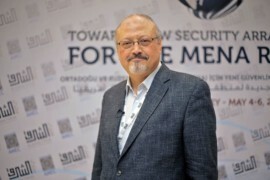 He warned against the dire consequences of repression, drawing a connection between the suppression of rights and political participation and the rise of violent extremism in the kingdom. Al Hamid’s philosophy on rights and governance was an integral part of ACPRA’s mission and work. In its foundation statement, ACPRA laid out its goal of “promoting human rights awareness to become a corner stone in our culture, and emphasizing other important values such as justice, rights, political and ideological plurality, tolerance, and civilized dialogues.” With his ACPRA co-founders, al Hamid educated Saudi society on the importance of rights and their basis in Islam while advocating on behalf of Saudi political prisoners arbitrarily detained by the Ministry of the Interior (MOI). In March 2013, the court ordered the closure of ACPRA and sentenced al-Hamid to eleven years in prison, coupled with a five-year travel ban upon release. Despite his detainment at al Hayer prison in Riyadh, al-Hamid continues to write. Earlier this year, Saudi authorities began interrogating al-Hamid for sending a letter to the King from prison entitled “The Flaws of despotism.” The Saudi authorities’ repeated attempts to intimidate al-Hamid even from behind bars illustrates the power of al-Hamid’s ideas and the futility of government attempts to stifle them.